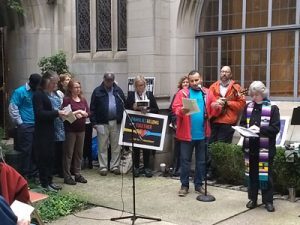 Around 100 people gathered in the courtyard of the 4th Presbyterian Church on Tuesday night to sing, pray, and get equipped for action to keep families together by defunding ICE, restoring Temporary Protected Status, and supporting individual detention and deportation cases. As the sky grew darker, ArtWorks projected images on the side of the church building of an immigrant family that was separated in Detroit. 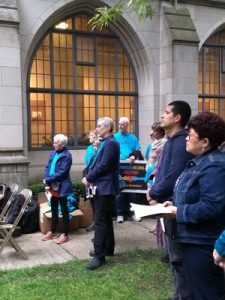 We lifted up the more local case of a young woman, whose mother and brothers are seeking asylum and are sponsored by Lake Street Church in Evanston, while she remains detained in Texas and threatened with deportation. Chris Inserra and singers she gathered led us in energetic group singing, Rev. 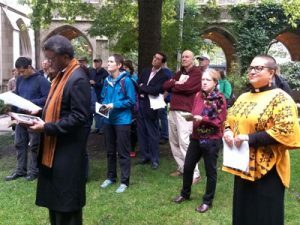 Vicky Curtiss (4th Presbyterian Church) led us in prayer, Rev. Marilyn Pagan-Banks read inspirational poetry that reminded us of our power. 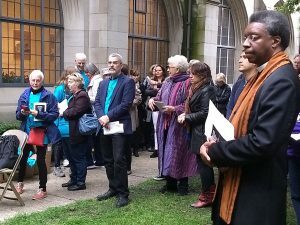 Many leaders of faith communities and organizations –Rabbi Brant Rosen (Congregation Tzedek), Rev. Sara Wohlleb (Interfaith Community for Detained Immigrants), Amy Shannon (Alianza Americas), Claudia Lucero (CRLN), Julian Lazalde (National Immigrant Justice Center) spoke eloquently about the cruelties of our immigration enforcement system and the way we mistreat asylum seekers, the need to cut ICE’s budget and to stop the expansion of private for-profit prisons, the need to prevent another round of family separations by finding a way for people whose Temporary Protected Status was revoked to stay in the U.S.